Create Embellish Adore: Its 17 degrees and its grillin time! Its 17 degrees and its grillin time! You never know when hunger strikes, and what it is your hungry for, so it shouldn't be a surprise that at 17 degree weather - I am jonesin' for a burger! I have it in my favor that the grill is about 10 steps outside my sunroom door and its cleared of the recent snow.. so why not fire it up for some yummy burgers!! Ingredients: Stamps- retired SU! 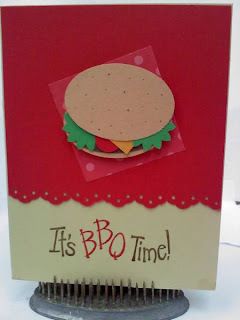 Its BBQ time; CS- Real Red, Real Red DSP, Sahara Sand, Green,chocolate chip, kraft, mustard. Punches- Wide oval, large oval, small square, 1 /4 circle, boho flower, eyelet edge border. Thanks for visiting my princess invitations and leaving a comment, I've got secrets like you wouldn't believe up my sleeve!! !